Known as a top U.S. golf destination, Minnesota offers 490+ courses characterized by beautiful natural settings, excellent conditions and affordability. The overall “Quality” of golf in MN cannot be matched. The listing of golf courses included in the roster of the Explore Minnesota Golf Alliance constitutes a hall of fame of National and Regional “Award-Winning” courses from such publications as Golf Digest, Golf Week, Golf News, Business Week, Sports Illustrated, National Golf Course Owners Association, Midwest Golf Course Owners Association etc. etc. – hundreds of awards. From metro area to resort links, there’s a wide selection of courses for an easygoing round of golf or a challenging game that tests your skills. “Value”is a major attribute of golf in Minnesota with green fees lower than other golf hotbeds around North America – almost always short of $100 and averaging $40-$50 for fantastic golfing experiences. Many facilities offer great Stay & Play packages. The roster of EMGA courses, and the overall availability of golf across Minnesota, delivers excellent “Geographical Disbursement” throughout the state. 90% of courses are open to the public. The “Variety” of courses allow golfers to opt for their favorite style – links, deep woods, breathtaking river and lake views all woven into Mother Nature’s natural beauty. Choose from family friendly par-3 and executive courses to championship courses and former pro tour sites – Minnesota has it all. There are championship courses throughout the state; Minnesota was the first state to host all 13 USGA championships. It’s also home to Champions Tour-3M Championship, and hosted the Ryder Cup in 2016. Minnesota will host the 2019 KPMG Women’s PGA Championship, THE Best golfers in the world play in Minnesota – both men and women! Minnesota has a rich history of championship professional and amateur tournaments. 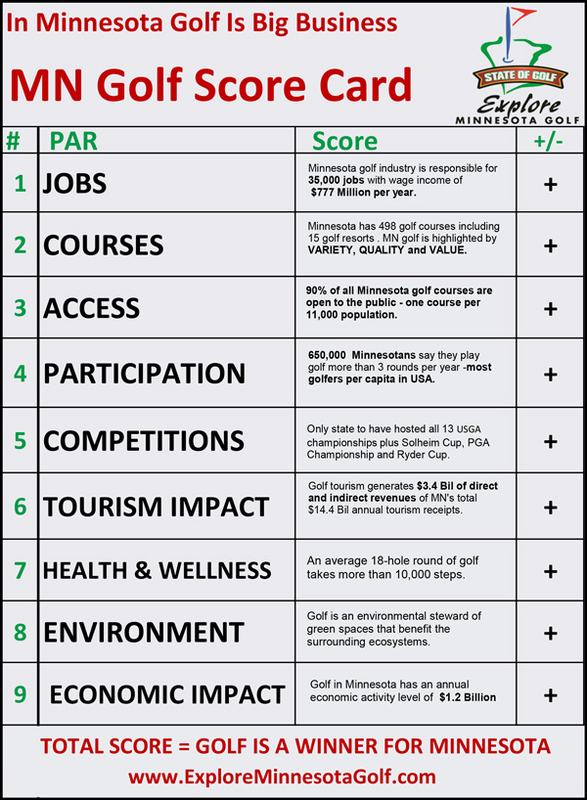 The Golf Industry is extremely important to the State of Minnesota generating almost $3.4 Billion in direct and indirect and induced economic impact of the total MN tourism receipts of approximately $14.4 Billion. To put the golf business in perspective, golf’s economic output is on par with the following industries: dairy products ($1.6 billion); printed circuit assembly ($1.3 billion); and accounting, tax and payroll services ($1.8 billion). Discover what Tom loves about Minnesota golf!